Today we are beginning the last leg of our wonderful journey. We are on the beautiful coast road back to Cape Town. In some ways it reminds me of the Big Sur coast but with a gentler slope to the mountains as they come down to meet the sea. 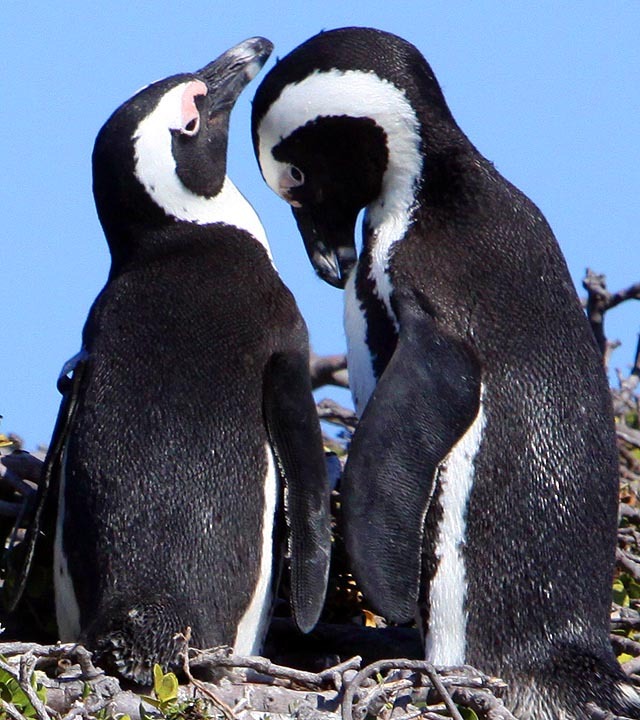 There are a few other differences like a bright turquoise hue to the water, African penguin colonies and the famous great white sharks that feed off the seals that live here. Everywhere we travel we see a huge variety of landscapes and many social contrasts of a country still trying to overcome the inequities of Apartheid. In Cape Town the main event will be our interview with Archbishop Tutu – just a day away now. Tomorrow we will visit the Philani Child Nutrition Project where we will deliver the 22 bags of clothing and a check for $2700 the students collected prior to their trip. We will spend a good part of the day doing some work projects for Philani and distributing the clothes to their five different centers in the township. During the next four days we will also visit the MY Life Project, and Dance for Life, a project that teaches children from the townships in traditional African dance. We also hope to have an interview with some of the veterans from Robben Island who were incarcerated with Nelson Mandela. After our recent visit to the island I think this will be a very meaningful engagement. The students have done really well so far on this journey. The past couple of days out at See-Eike farm we had a chance to work on our upcoming interview and engage with the Learning Journey framework that helps the students reflect on their experience become aware of how they are engaging on the road with the concepts and skills of the Values in World Thought class. This trip seems to be an exquisite fusion of adventure, challenge, learning moments, and fun. It appears to me that many of the students are trying hard and it seems they are changing right before our eyes. I am gratified at how well they are all getting along together and how they support one another. They have also been very flexible to the inevitable changes of plans and minor inconveniences here and there. I think it will be interesting to witness how they integrate what they have seen so far and all that still remains to be experienced. I think we are seeing their best. Everyday I am happy that Lisa, Shannon, Shmuel and Devin are also on this trip, each one contributing their different skills. We will do an upload to the blog tonight, including a video clip from Kruger that Devin has prepared. Shmuel will be sending out a new story for the Santa Cruz Sentinel tonight. It should run in a day or two. Thanks everyone for visiting the site and for your comments. The students are encouraged by the fact that you are following their journey. In the fall of 2000, when I was in third grade, I traveled to Africa. I didn’t realize the rare opportunity I had been given at such a young age. Never the less, I made the most of the trip, waking up at an ungodly hour to see the game in their natural habitat. These experiences have always been in the back of my mind. Now I have been given the amazing chance to re-live some of those adventures. For example, today we stopped at Stony Point to watch the African penguins. As a wild eight year old I jumped the fence separating me from the penguins to play with them close up. Now, as a seventeen year old, I am more composed, but still just as excited to see, hear and smell one of my favorite animals.